The theme for TEDxAmsterdam Women 2013 was “Discover the Truths. It takes more than one tale to tell a story”. With such an impressive set of talks, it is hard to single out a favorite, or even a few, but some have stuck with me more than others. 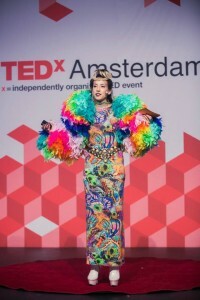 The most colorful one, and the one that challenged my thinking most about preconceptions and communications, was by Dutch fashion journalist Aynouk Tan. After seeing her in various outfits and making us think how her clothes drive what we see, she argues that you are never what you wear. “You are what you eat” has been used over and over again – and I personally had not given much thought about transferring that same phrase to the clothes I wear. Aynouk’s TEDx talk briefly touched on the sustainability challenges of fashion, making us think about what the impact of our clothing is outside of our immediate world. Another speaker Willa Stoutenbeek said this brilliantly “Because we’re not willing to pay more for sustainable products, it doesn’t mean that no one else pays the price”. But Aynouk’s core message was about how what we wear changes how others see us and how that can shape how we feel. This was all about self-esteem and being true to yourself. I think all women know from experience that what she wears can truly influence how she feels and even acts. A related Pantene ad from the Philippines went viral early December 2013 – helped by Google’s Sheryl Sandberg highlighting it as a good example of a brand “leaning in”. Framed by the (very appropriate) song “Mad World”, you see how very differently men and women are perceived. Unfortunately, no matter what you wear and how you feel, gender prejudice continues. Lucy Kellaway’s article in the Financial Times about investing in good hair is a funny take on this Pantene ad. She worries about how long it takes a woman to blowdry her hair to get ready to work. I’d like to add to that the time it takes to choose the ideal outfit (with matching shoes) to fit the events and challenges of the day – and the disadvantage for the shareholders could get even bigger. Yet, at the same time, I would argue that women, more so than men, have a unique advantage to add color and diversity to any meeting or event. The beautifully diverse audience of 496 women (and four men) at TEDxAmsterdam Women made this very clear. Any success stories on how you’ve added the power of what you wear to the power within to drive change?